Daimler Trucks, a division in the Daimler Group, and Torc Robotics, a pioneer in autonomous driving solutions, are joining forces in a unique partnership aimed at commercializing highly automated trucks (SAE Level 4) on U.S. roads. 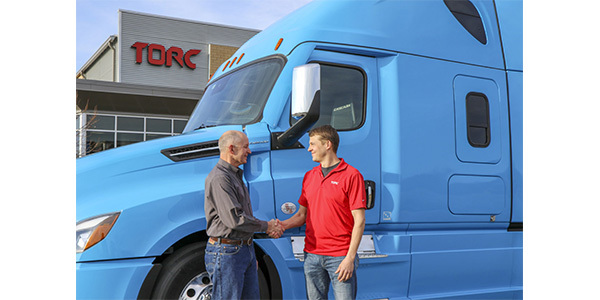 Going beyond an OEM/supplier relationship, the companies signed an agreement for Daimler AG’s subsidiary Daimler Trucks and Buses Holding Inc., to acquire a majority stake in Torc Robotics for an undisclosed sum. Closing of the acquisition is subject to approval from U.S. authorities. Michael Fleming, CEO of Torc Robotics, Martin Daum, member of the board of management of Daimler AG, responsible for Trucks and Buses, and Roger Nielsen, CEO of Daimler Trucks North America LLC, announced the strategic move friday at Torc headquarters in Blacksburg, Virginia. “With the ever-rising demand for road transportation, not the least through e-commerce, there is a strong business case for self-driving trucks in the U.S. market and I believe the fastest path to commercialization for self-driving trucks is in partnership with Daimler Trucks, the OEM market leader. This move is in line with our mission of saving lives and represents another major milestone for Torc since crossing the finish line in the DARPA Urban Challenge 12 years ago,” said Michael Fleming, CEO of Torc. “Bringing Torc Robotics within the Daimler Trucks family creates a unique and powerful team of innovators to put highly automated trucks on the road. Daimler Trucks and Torc Robotics complement each other perfectly in terms of resources, expertise and skill sets. We are forming the ideal combination between Torc’s expertise on agile software development and our experience in delivering reliable and safe truck hardware,” said Martin Daum, member of the board of management Daimler AG, responsible for Trucks and Buses. “Together, we will provide a sustainable way for our customers to meet the ever-growing freight demand and benefit both the economy and society,” he said. As part of the overall agreement, the Torc team will work closely with Daimler Trucks’ developers, particularly with the Research & Development team of Daimler Trucks North America in Portland, Oregon. Torc will continue to develop its Asimov self-driving software and testing at its Blacksburg, Virginia, facility. At the same time, DTNA will focus on further evolving automated driving technology and vehicle integration for heavy-duty trucks at its Automated Truck Research & Development Center in Portland. The DTNA team is working on a truck chassis specifically for automated driving, particularly the redundancy of systems needed to provide the maximum level of reliability and safety. Under the agreement, Torc will remain a separate entity retaining its name, team, existing customers and facilities in Blacksburg, Virginia. The partnership with Daimler Trucks will enable Torc to expand significantly its team and to engage into the trucking market and service its growing customer base in other markets.